Good morning, Steeler Nation! How's the holiday weekend going? Are yinz nursing holiday hangovers? Taking it easy? Whatever your plans, I've got the perfect brunch recipe for a lazy long weekend. 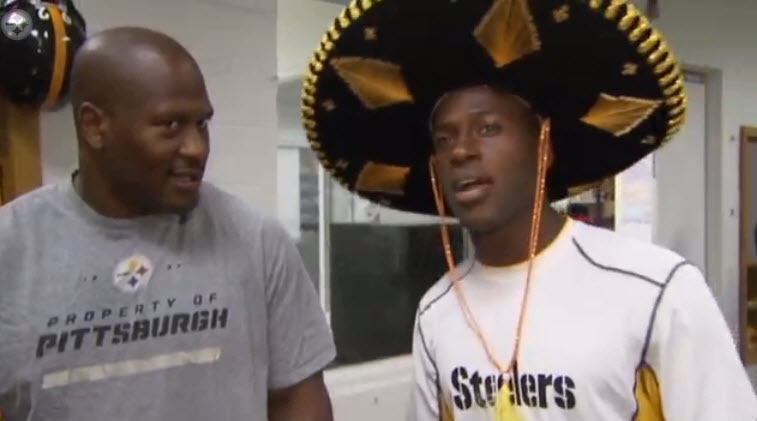 If this were July 2009, we'd be talking Super Bowl MVP Santonio Home Fries - but, it's 2013, Antonio Brown is our Pro Bowler, record-breaking, wide-receiving man, about to enter into his fourth season as a Steeler, so Antonio Hash Browns it is! I prefer the crispy, golden hash brown patties over the fried potato salad that is home fries anyway (and a less crispy wide receiver who's a family man rather than a law-breaker). 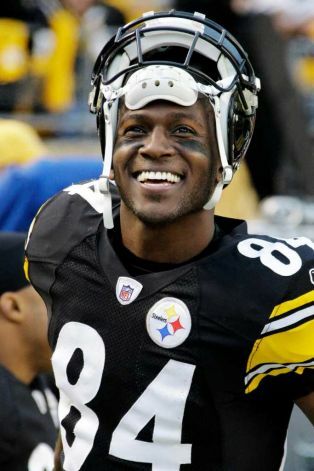 Antonio Brown was the Steelers' MVP for the 2011 season. That year, he became the first NFL player to record over 1,000 yards receiving (1,108) and over 1,000 yards returning (1,062) in a single season (SI.com). He also set the franchise record for all-purpose yards in a season (2,048). 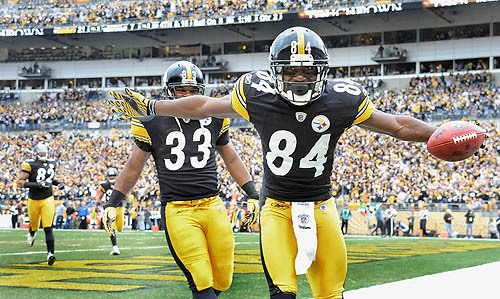 Last summer, Brown signed a 5-year contract extension with the Steelers, so buy those #84 jerseys with confidence! 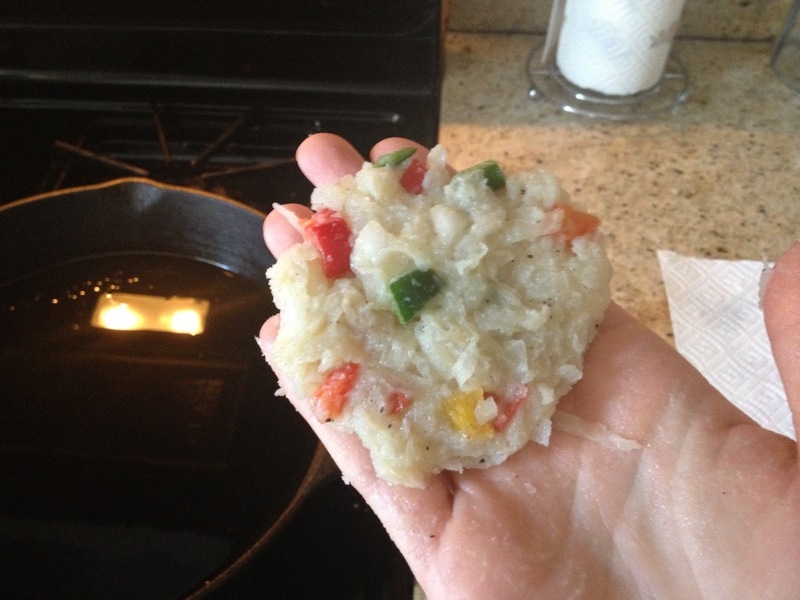 I've gotta say, these hash browns turned out perfectly - and they were actually kind of a happy accident. When I was making my 4th of July tater tots, I made the mistake of boiling the potatoes before peeling and shredding. The embarrassing part is that I've made this mistake before and clearly didn't learn. (When the potatoes are too soft, they become more like fried mashed potatoes rather than tots. It's kind of gross.) Luckily, I still had a ton of potatoes on hand, so I stored the first batch of shredded, seasoned potatoes in the fridge for a few days and started over with unboiled potatoes for the tots. 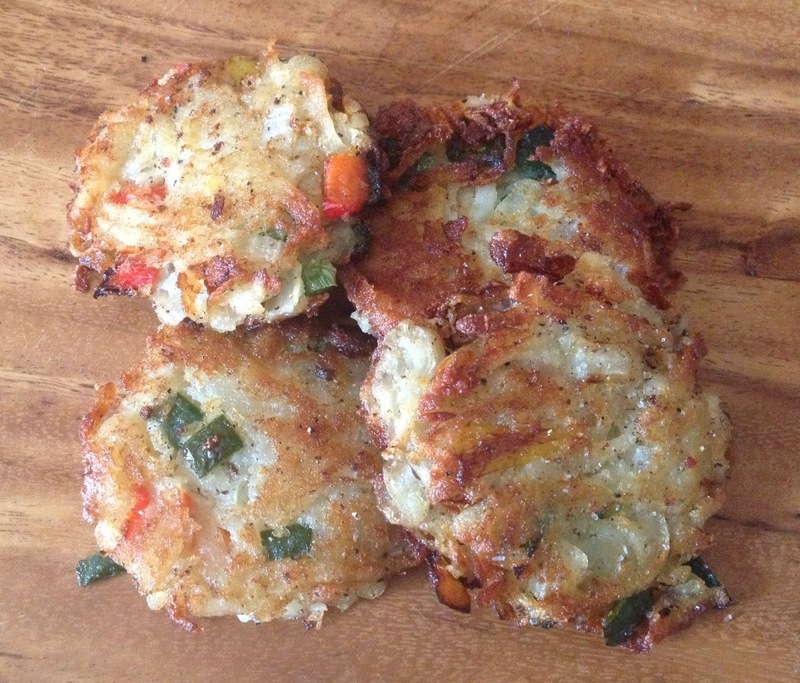 The refrigerated taters were perfect for these hash browns. I chopped up some onion, poblano pepper and sweet peppers and mixed them in. If you like some spice, you can use jalapeños, just watch out for those seeds! 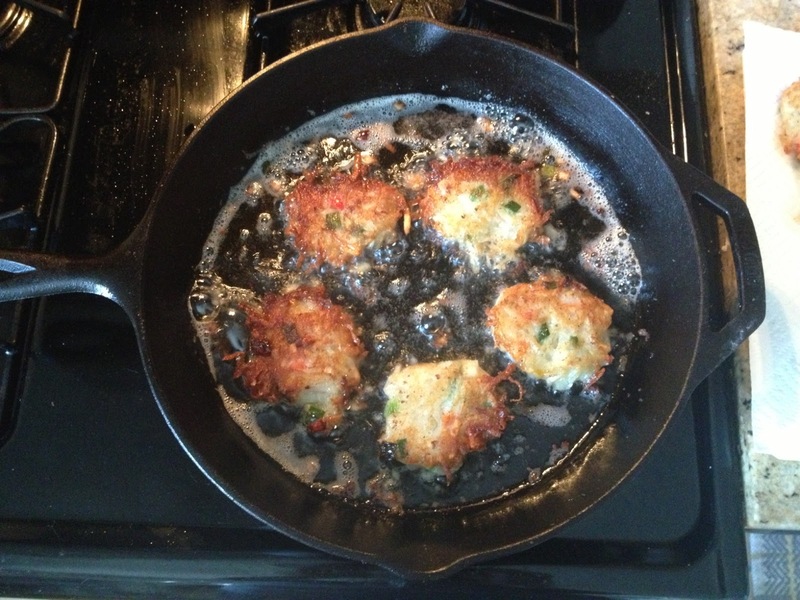 This recipe made a LOT of hash browns - about 24 - so if you aren't planning to serve brunch to a family of 6 and you don't want to eat hash browns for an entire week (though I don't personally see a problem with that), you can scale it down. Bring a large pot of lightly salted water to a boil. Boil potatoes for 10 minutes, then remove and let cool. Peel the potatoes and shred with a medium box grater or in food processor with medium shred disc. Put shredded potatoes in large bowl and throughly mix in salt, pepper and egg. 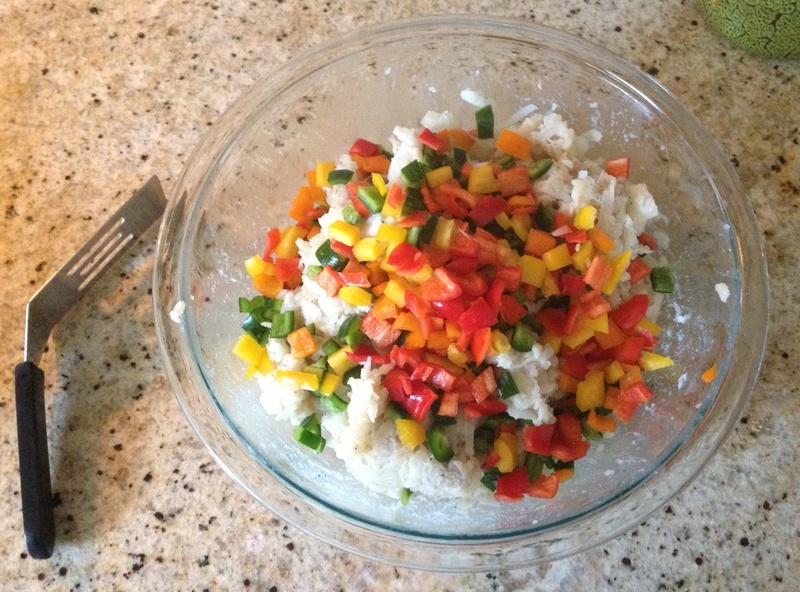 Fold in diced peppers and onion. Cover bottom of cast-iron skillet with vegetable oil (about 1 1/2-2 cups) and heat on medium-high. Form small patties (2 1/2 inches across and 1/2 inch thick) in your palm. Once the oil is hot, pan-fry in batches about 5 at-a-time, 5 minutes per side or until edges become golden brown and crispy. Flip, fry for another 5 minutes, remove and place on paper-towel lined plate. Repeat until potato mixture is gone. Season with salt and pepper and serve with bacon and eggs!